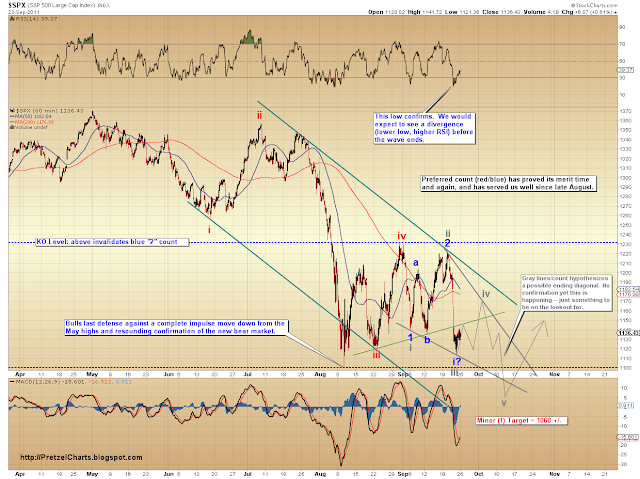 At the request of a reader, I have updated the charts to reflect the two possible conclusions for wave v-down of Minor (1)-down (for further clarification, see the 9-22 update) . Once Minor (1) concludes, we should see a multi-month rally ensue. I believe this rally will be a fantastic opportunity to accumulate heavy short positions, as the wave which follows will be Minor (3) down, which should be faster and more furious than Minor (1) by an order of magnitude. Quite frankly, wave (3) will probably be somewhat frightening (think 2008 crash). Once Minor (1) completes, we will begin projecting targets for Minor (2) and eventually Minor (3). The two charts are annotated slightly differently to reflect the two possible waveforms v-down may take. The price targets are quite different as well, with the ending diagonal having a target in the 1060 range, and the other waveform reaching all the way down toward 1000, and possibly even lower. We are favoring the view that the current corrective wave still needs wave c-up to be complete, although the outside possibility exists that we have seen the entire rally. A move above the recent high of 1142 would indicate that wave c is unfolding, with a target of 1155-1170 to complete the current rally. 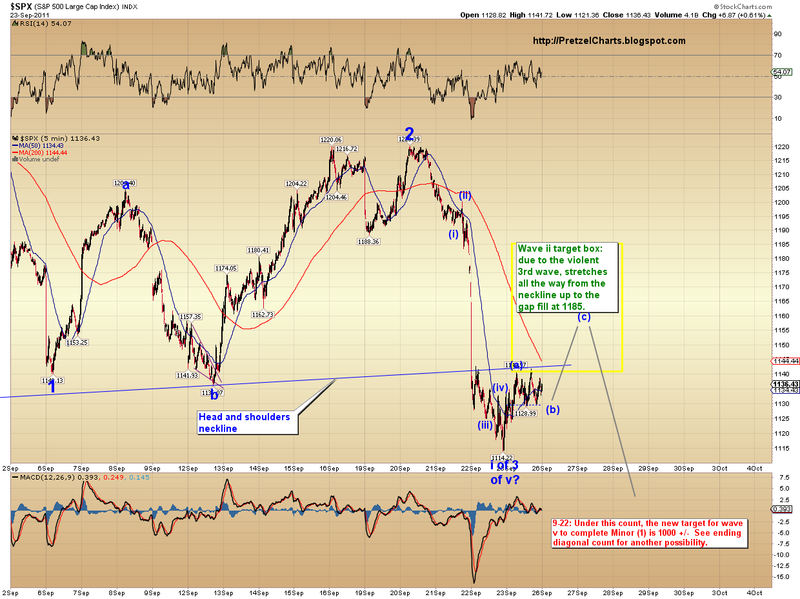 If our preferred count is correct, the market should then turn down from that range and make a new low. When looking at the charts, keep in mind that the ending diagonal (the wedge on the first chart) is purely speculative at this point, and mainly shown to alert our readers to the possibility, and help keep our readers on their toes. Unless the current rally starts showing more strength, we will continue favoring the more bearish count with a target of 1000 +/- (note, we did have to revise this target lower after wave v-down actually started -- older charts show 1060, but that was from before wave iv-up had even ended).